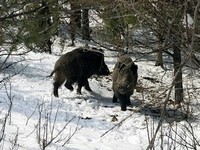 In the forests of the Isperishka municipality different kinds of small and big game are to be found. 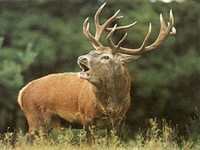 The big game that can be found is the red deer, hind, wild goat and wild boar. The small game that can be found is hare, pheasant, partridge and wild duck. During the different seasons there can be found also migratory kinds of birds like the quail. Also different kinds of predators can be found like fox, jackal and wolf. The limited territory of Historical and Archaeological Reservation "Sboryanovo" is roundabout of workable lands. That territory has become a protection of the birds. Here can be found nesting falcons, four kinds of woodpeckers, nightingales, titmouses, herons, bee-eaters, swallows - 47 kinds of birds at all, 10 of them are recorded in the Bulgarian Red Book and 3 of them are in the European Red Book. The birds are not the only new monotypes in this area. Here also can be found hinds, dears, wild boars, badgers, foxes, polecats, turtles and snakes. The field parts of this area are the kingdom of the family of the rodents - hamsters, field-mice, but the most numerous are the hares. On territory of the municipality are situated and hunting ground: "Voden", "Iri Hisar" and "Palamara".